Method on Methods follows a senior thesis from start to finish over the course an academic year. For 2014/2015 school year, Lifestyle Editor Willa Nielsen (‘17) writes on English major Billy Donnelly’s thesis, a graphic novel advised by Professor Cliff Chase. Billy Donnelly is not a studio major. He’s an English major, who’s been spending hours on end each day drawing. Billy is in the middle of finishing his graphic novel, a project that’s been in the works for longer than most. The process of combining literature and art is definitely an intimidating one, but Billy doesn’t shy away from it. “My whole life I’ve sort of been like struggling between being a writer and being an artist… Now I’ve finally accepted that no, I have to be both at the same time and this is how I do it.” When asked about his sketches and drawing, Billy replied “I definitely don’t think I’m the best artist ever, I don’t think I’m a terrible artist. I’m good enough.” Believe me when I say that he’s being modest. When asked “why a graphic novel?” he responded, “it’s the only option for me.” Originally, Billy was concerned that he wouldn’t be able to find an advisor. “When I started approaching professors, I was like ‘I would really like to do this as a graphic novel but I would be open to do it in prose if you don’t feel comfortable advising that’.” Sometime during the search, his stance changed. “No, this has to be a graphic novel. I can’t do this in any other way.” Luckily, he had a childhood full of comics as foundational research. The university from the graphic novel is unnamed, but there’s no denying that it draws directly from Wesleyan. “This is my school and I know way too many people who have been sexually assaulted here.” Cass, the main character, isn’t a survivor. “I felt uncomfortable depicting sexual assault and I don’t feel qualified to depict someone’s mental state after that,” Billy explains, “so the thesis is more concerned with the… more day-to-day aspects of it, like cat calling, and how guys will come up to girls at parties and just start dancing with them.” The ideas and examples in the graphic novel draw directly from experience and stories told by friends about being a woman at Wesleyan. Cass, the protagonist of Billy’s story, has been on his mind for a while. “She was the subject of the first story I wrote.” She’s been in the works for years, and the version that we see today is more developed and matured. Not unlike the author who created her. Back when she first appeared, Cass was “a way for me to explore my gayness without being accused of being gay because she was a lesbian.” She originally represented a way of living that was seemingly out of reach. 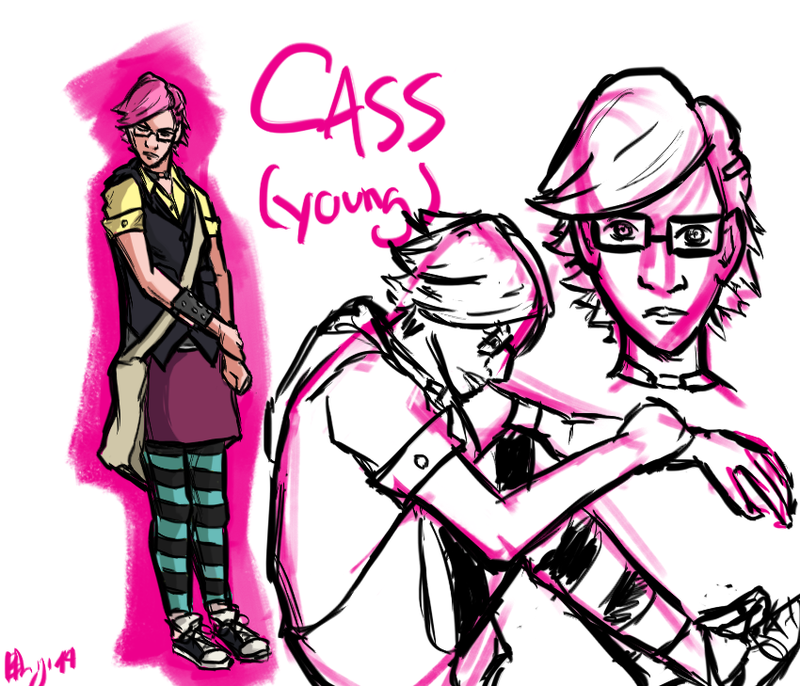 But this past september September, Cass was a character filled with ambiguity. “I know who she is, I just don’t know what her story is and that’s something that I’ve struggled with.” As Billy slowly unravels her story, he’s finding that she may not be the strong, outgoing and confident wish fulfillment character he originally created. But rather, a freshman in college. But of course, we can’t forget Fatima, Sam and Trevor. Billy’s emphasis on diversity and uniqueness comes through in each character. When it came to a supporting cast, Billy looked to his own. “I asked my friends what they wanted to see.” First there’s Trevor, Cass’ trans friend, the result of one friend’s desire to see more trans people of color. Then there’s Fatima, the Saudi American sexually liberated roommate described as “a Westco girl, but living in Clark.” Juxtaposed with Sam, the more sheltered and sexually reserved friend, the two open a wide range of ideas and behaviors surrounding sexuality. Although publication is the dream, “My ultimate goal is to finish it.” Fair enough. However, this means learning to edit. “I love the extraneous,” he admits. “The problem is that I’m a writer and I’m the creator so all the extraneous details are precious to me.” With limited space, a hundred and five pages to be exact, a large cast of characters, each with their own plot points, and almost a thousand things to say, Billy worries about being able to include everything he wants. “Some of my biggest influences are the long, sprawling 350 page graphic novels, where nothing happens and it’s like no… I have to make something happen.” Since the first interview, the script has been set and the drawing has started. But before we get ahead of ourselves, this project is still in the works. Cass is still growing, and Billy is still pumping out Espwesso fueled sketches. Our interviews will continue next semester as we follow his progress up until the very day he hands it in.